Collection of essays celebrates life of Dr. Luke Keefer, Jr. 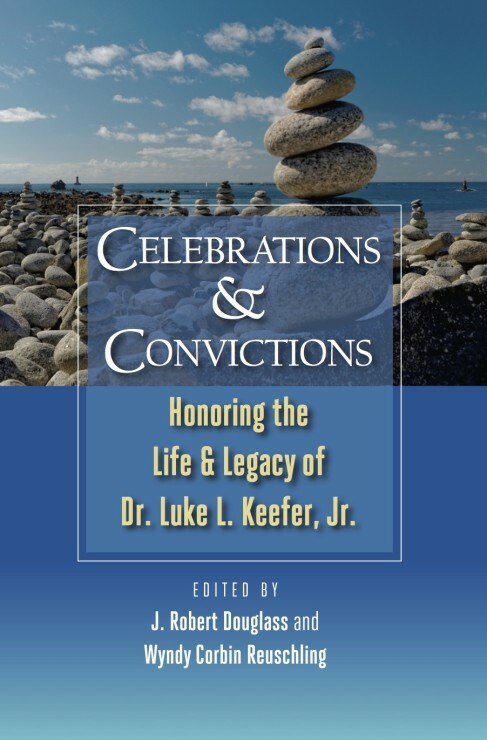 In early October, two events were held in Ashland, Ohio to mark the release of the book, Celebrations and Convictions: Honoring the Life and Legacy of Luke L. Keefer, Jr., edited by J. Robert Douglass and Wyndy Corbin Reuschling, and published by the Historical Society. Members of the Historical Society joined about 200 others at a conference at Ashland Theological Seminary in honor of the late Luke L. Keefer, Jr. Following the conference, the Society’s annual meeting was held at the Ashland Brethren in Christ Church. The church provided dinner, including the traditional annual meeting fare of homemade pie. At the annual meeting, Douglass and Reuschling, former colleagues of Luke’s at Ashland Seminary, about their memories of Luke and their experience editing the book. 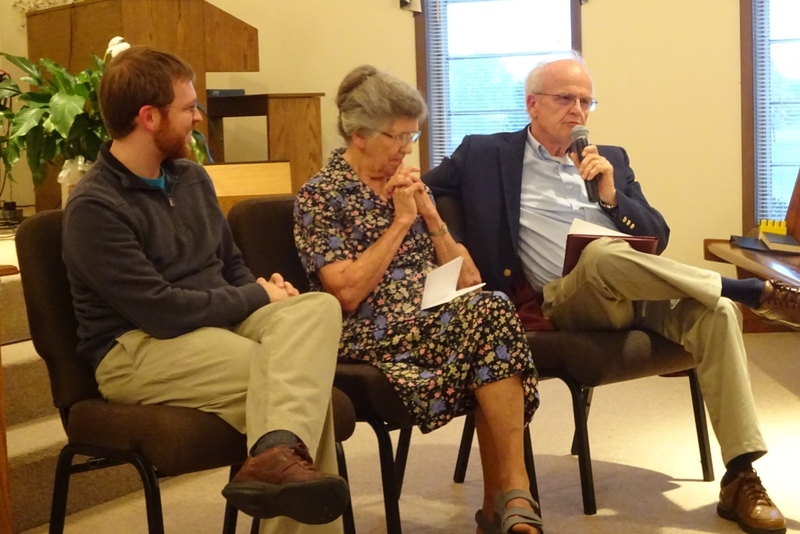 After their remarks, a panel discussion was held featuring three of the Brethren in Christ contributors to the book: Grace Holland, Zach Spidel, and John Yeatts (pictured below right). Devin Manzullo-Thomas, another contributor, moderated the panel. Attendance at annual meeting was not large, but those who were able to come appreciated the opportunity to celebrate their friend and colleague. Copies of the book are now available for sale from the Historical Society at $15 each plus shipping of $2.75 for one copy. You won’t want to miss essays that tell Luke’s life story, describe his role as mentor and friend, offer Luke’s own reflections on the “uneasy synthesis of heritage streams” in the Brethren in Christ Church, and address some of Luke’s interests and core convictions: Brethren in Christ history, heresy (something Luke was researching when he became ill), spiritual formation, Christian history from a Wesleyan perspective, missional identity, Anabaptist ecclesiology, women in ministry, reading Scripture, pacifism and nonviolence, and Christian ethical commitments. Contact the Society to order the book. 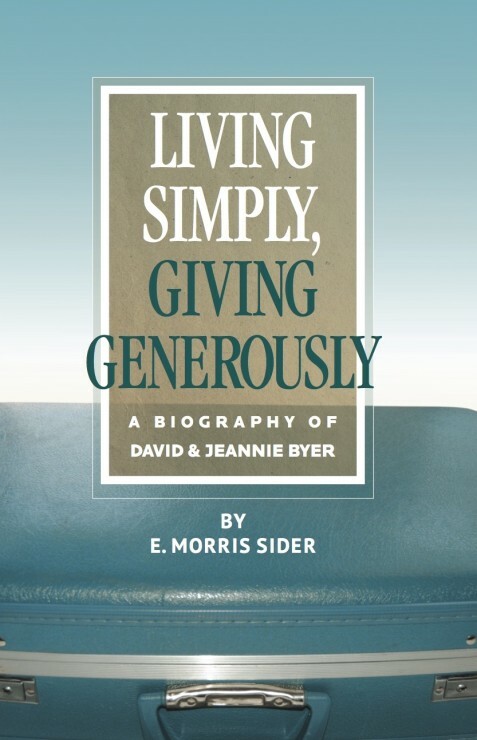 Living Simply, Giving Generously: A Biography of David and Jeannie Byer, was also published this fall. 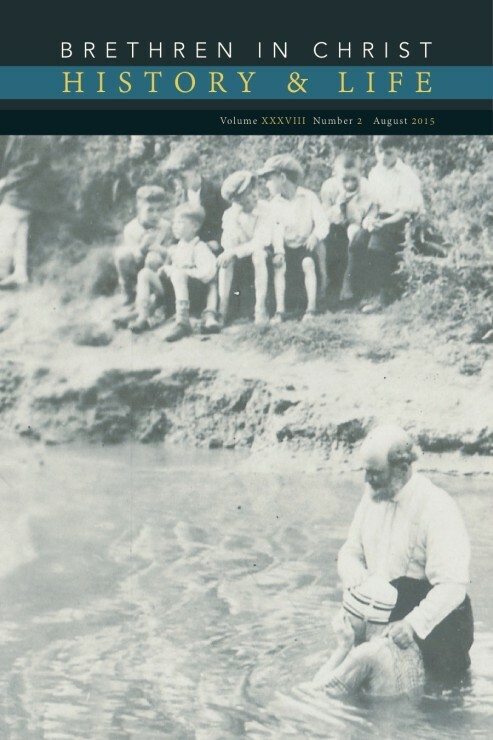 Written by Historical Society editor emeritus, E. Morris Sider, the biography was published in partnership with the Friends of Murray Library at Messiah College, one of many recipients of the Byers’ generosity. 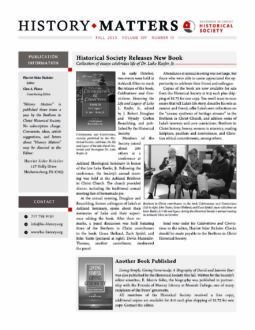 All members of the Historical Society received a free copy; additional copies are available for $10 each plus shipping of $2.75 for one copy. Contact the Society. 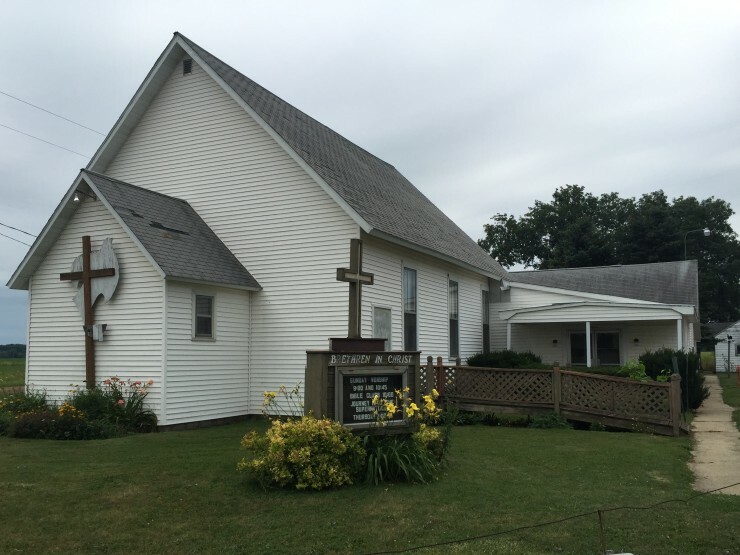 The Carland-Zion Brethren in Christ Church (located between Elsie and Owosso, Michigan) recently celebrated its 125th anniversary. 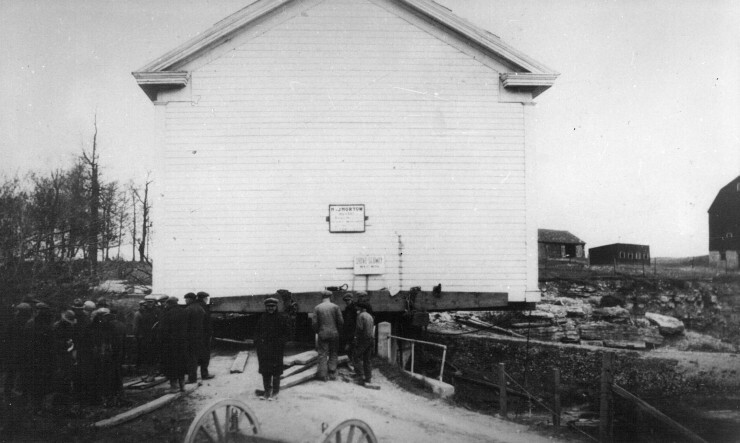 “Tunker” families from Markham, Ontario Canada who emigrated to Michigan established the church in the mid-1880s. It was the first Brethren in Christ congregation in the state and played an important role in establishing other congregations in Michigan – many of which remain to this day. Other pastors over the years included George Kiteley, Harry Brubaker, William H. Engle, Clinton Starr, Albert Brenaman, Harvey B. Stickley, Lloyd Melhorn, Jr., Roger Carr, Cyrus Lutz, Carl Lewis, Verle Brubaker, and Donald Bundenthal. The original building remains in use today as the main worship sanctuary. A parsonage was built next door in 1948, and a fellowship hall was built in 1958. 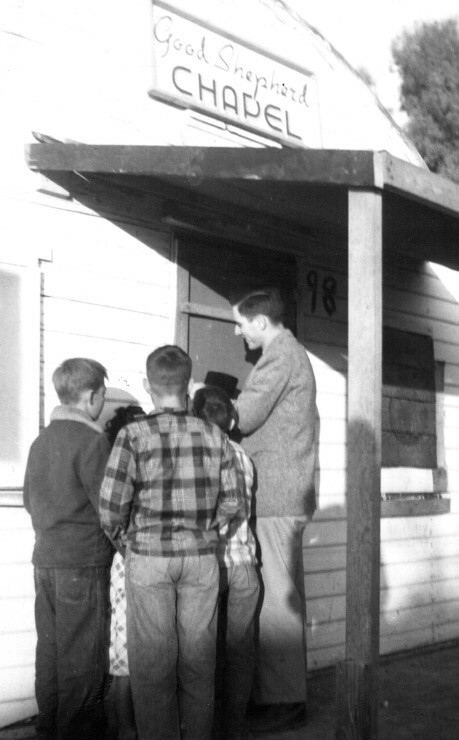 In the 1960s, the original church and fellowship hall were connected with a building that includes classrooms, a nursery, restrooms, and office space. At that time, the layout of the sanctuary was reversed, and the original entrance area became the pulpit/preaching area. 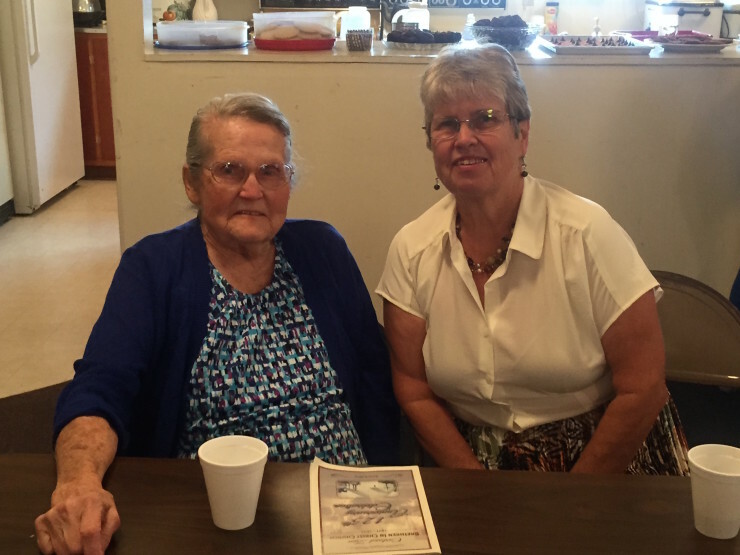 The congregation’s oldest member, Leoda Kiteley Brady, and her daughter, Mary Brady Ford. Leola is a descendant of Bishop Henry Schneider. Photo by Laura Reppenhagan. Current Pastor Eric Stanton, who has served the congregation for more than twenty-five years, led a hymn sing and a time of sharing memories and stories from the past. Bishop John Zuck gave a brief message and a time of fellowship followed. Church members are gathering memories and stories which will be placed in a time capsule to be buried this fall. Who would follow Jesus in answer to His call? Preaching the gospel everywhere…even in Michigan! Because the Word that was preached to them was sharp as a two-edged sword. To worship God and grow in grace and fellowship so sweet. In which to carry out God’s work, and thus send forth the light. Its rays penetrating the darkness, the darkness of sin and night. Salvation is through Christ alone, by works we can’t attain. Our sins all covered by the blood assures a home in heaven. Instruction in holy living was among the things they taught. Some chose to follow Christ – the only right choice to make. How sad for them when called to account upon the Judgement Day! Jonathan Stanton is the son of Eric Stanton, current pastor of the Carland-Zion congregation. Jon lives in Omaha, Nebraska with his wife and serves on the editorial committee for Shalom!, a Brethren in Christ publication on peace and justice issues. Much of this information is from a brief history of the church written by Anna Kiteley in 1959. Recently, while conducting research in the Archives photo collection on another topic, we came across a folder labeled “California: Huron Cotton Camps.” Markings on the photos led us to an article, “Migrant Work in California,” in the missions insert of the January 28, 1957 issue of the Evangelical Visitor. The article was a news items about a new Home Missions pastorate which began in October 1956. At that time, Carl and Marilyn Wolgemuth conducted their first service at a migrant labor camp in Fresno County, California. One of the larger cotton camps in the Huron community, “Camp 4,” consisted of some 100 small quonset cabins and space for many trailers. The chapel was a double-size quonset formerly used as a cook-house. In the article, the Wolgemuths reflect on the early endeavors in this mission project, the living conditions of the migrants, and the long-term prospects of the mission. Selections from the article appear below. “Interest among teenagers in Sunday evening services led to a series of campfire services outside the chapel during November and early December. Singing choruses and gospel songs to the accompaniment of the guitar, the group are [sic] prepared to listen to testimonies and a short, pointed Gospel message at the close of the fireside service…. “Life is drab and tragically barren for the migrants. The privilege of sharing with the Mennonite Service Unit and others in a ministry to these people is much appreciated. The camp folks now have opportunity for activities under a Christian influence – after-school Bible Clubs with handcrafts for children, recreation for the teenagers, and sewing classes for mothers. In recent months, several members of the Historical Society who are finding it necessary to “downsize” have offered to donate their complete set of Brethren in Christ History and Life to a young historian, church library, or anyone else interested in history. For more information, contact Glen Pierce, director of the Brethren in Christ Archives by email ([email protected]), phone (717-691-6048), or postal mail (One College Ave., Suite 3002, Mechanicsburg, PA 17055). Services were held in homes of members for the first ten years. 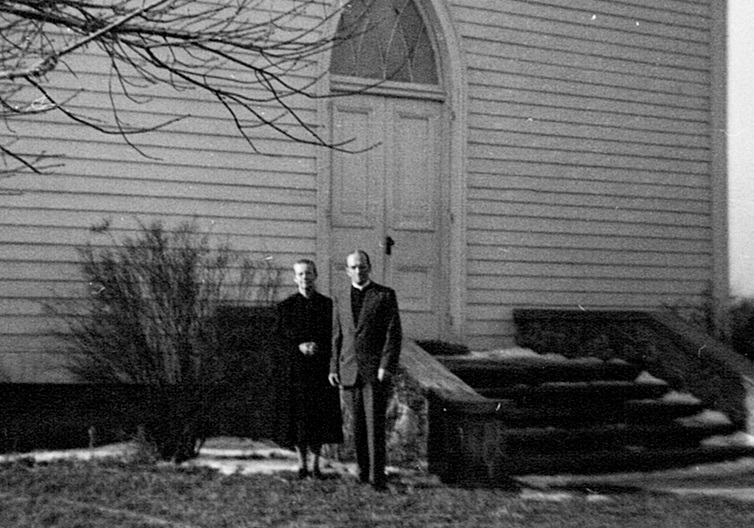 The second photo shows Pastor and Mrs. Earl Sider standing in front of the church shortly after the congregation celebrated its twenty-fiftj anniversary of being in the building.